This winter, Girls Rock! Rhode Island is offering a variety of group music lesson opportunities for youth and adults — see offerings and schedule below. All lessons will be held at Girls Rock! Rhode Island’s Headquarters, located at 769 Westminster Street on the west side of Providence (right across the street from Classical High School) and start the week of January 20th (Vocals will start one week earlier on January 14th). Classes run for 10 weeks culminating in a final community concert on April 13th. Registration is required and is first-come, first-served. Need-based financial aid and gear loan available. We welcome girls, women, trans, and gender non-conforming individuals in our programming. To learn more about our Band Booster program, or other programs visit our Camps & Classes page. For both youth and adult classes: we will explore VOCALS, including good vocal technique, expanding and accessing your range, using your voice as an instrument, basic music theory and literacy, sight singing and ear training, songwriting, turning those conversations in your head into lyrics, harmony and backups, rhythm, getting to know mics, loops and pedals, and so much more! A note about gear: No gear required! Adults Beginner- 6:00-7:00pm** THIS CLASS IS SOLD OUT! In this class you will learn how to play beats and fills, and how to put them together to play songs. We will do all sorts of fun, creative activities to develop your skills as a musician and drummer including reading music, listening to music, improvising, writing our own beats, and learning different ways to play with other instruments. A note about gear: No gear required! You can use our kit during class (though we recommend you have a drum kit, or at least a snare, at home to practice). Learning keyboard will keep you from being bored! In this class, we’ll learn keyboard basics, such as one and two-hand technique, notes and scales, major and minor chords, and intro to theory. 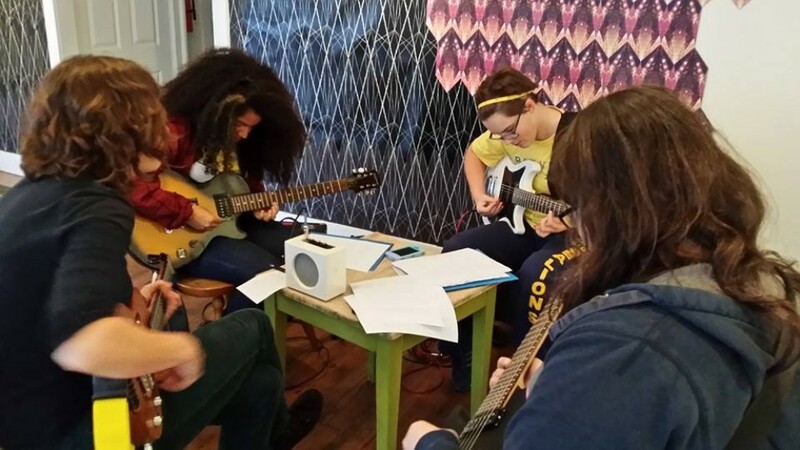 We’ll learn the foundations of song-writing, so we can express ourselves and write our own! A note about gear: No gear required! You can use our keyboard during class (though we recommend you have a keyboard or piano at home to practice). Bass is the place! In this class, you’ll learn the notes, rhythm, scales, and techniques needed to get you started on the bass guitar. You’ll also learn about the important role of the bass in a band. In this class, you’ll learn improvisation as a tool for songwriting, and the basics of music theory too! Popular songs will act as a gateway to all of your own musical inspiration, as you hold down the low end as a brand new bass guitarist. A note about gear: We ask you to bring your bass to class (Gear Loaned or otherwise), and we will provide an amplifier. First, we will start at the absolute beginning: you’ll get to know all the parts of the guitar from frets to strings, tuning, healthy playing habits and technique. In addition to learning chords and strumming you’ll also learn about the basic elements of rhythm and lead guitar that will have you jamming out in no time. We’ll also cover the learning of songs, reading tablature and notation for guitar and some helpful introductory music theory concepts! Finally, all of this knowledge will be contextualized by diving into the songwriting process as a group. We will move at a friendly, comfortable pace and ultimately give you more tools to take your guitar to the next level of awesomeness! A note about gear: We ask you to bring your guitar to class (Gear Loaned or otherwise), and we will provide an amplifier. Want to accompany yourself as a singer songwriter? Want to start a family band? In this class, you’ll get to know all the parts of the ukulele, from frets to strings, and then learn the proper technique for playing ukulele. In addition to learning chords, strumming and tuning, you’ll also learn about the basic elements of rhythm and lead playing that will have you jamming out in no time. We’ll also learn about reading tablature and notation for the ukulele and some helpful introductory music theory concepts. All of this will be contextualized by diving into the songwriting process as a group. This is a great first instrument to start on, you’ll be shredding in no time! A note about gear: We ask you to bring your own ukulele to class. Unfortunately, we cannot provide or loan out ukuleles, but we can point you towards some affordable options! If there are any cancellations due to weather, instructor illness, or other unforeseen circumstances, we will reschedule the class based on instructor and participant availability. All Group Lessons will be held at Girls Rock! Rhode Island’s program and office space: 769 Westminster Street in Providence, RI (across the street from Classical High School). Street parking on Westminster Street is metered until 9pm. There is also a free parking lot behind our building — enter from Washington Street. Cost for all 10-week classes is $250. We have need-based financial aid for those who are unable to pay full tuition. Partial pay participants will pay what they can based on their ability; participants receiving a full scholarship will have their tuition covered by Girls Rock! RI. If you are interested in applying for financial aid, please indicate on the registration form in the “payment and financial aid” section. Payment for Winter Group Lessons is due one week prior to start date. As a participant, you can borrow an instrument through our Gear Loan program to practice at home. A small deposit is required, which is refunded when you return the instrument. If you are interested in Gear Loan, make sure to check the box on the registration form for Gear Loan. There is limited capacity for each class and registration is first-come, first-served for each tuition category. Registration must include enough paying participants (determined by staff) for class to run. We rely on tuition fees to run this program, which requires a certain minimum of paying students. If registration is low, classes may be cancelled and participants will be contacted by GRR! staff. Questions? 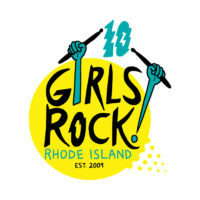 Contact our Program & Operations Coordinator, Rikki Davis, at rikki@girlsrockri.org or 401-443-2873.